This image comes from the same collection I featured when Great War Photos began a month ago; it was taken by an officer of the battalion, Ron Short, who served with the battalion in Belgium, France and Italy 1917-1919. 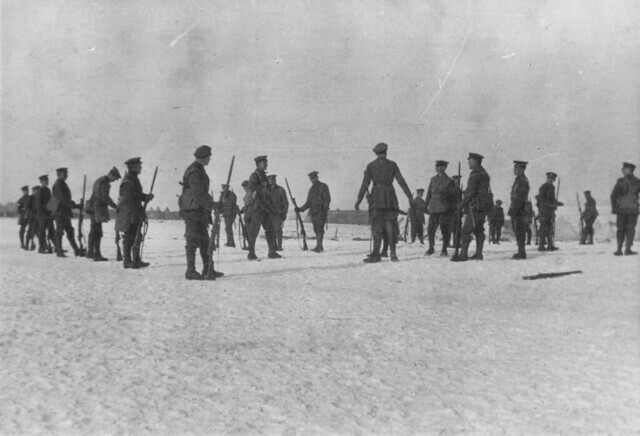 At a time of year when snow is imminent, this photograph of men of the 2nd Battalion Queen’s Regiment, part of 7th Division, doing bayonet practice in the snow of the old Somme battlefields is particularly poignant. While the Somme front had been abandoned and British troops moved forward towards the Hindenburg Line, units out of rest would use the old Somme area and carry out training here, even in the cold and snow of winter. The late winter and early spring of 1917 was especially cold and snow fell well into April. This entry was posted on 03/02/2012 by sommecourt. It was filed under BEF, British Army, France, Great War, Somme, Western Front, WW1 and was tagged with 1917, Bayonet, Great War, Queen's Regiment, Somme, WW1.